Do you know the answer? If you want to become a Canadian citizen, you should. For you need to answer 20 multiple-choice questions like this one in your citizenship exam, one of the steps on the path between permanent residence and naturalization. Helpfully, the government provides an official study guide for free. And yes, there's also an app for that. The test, while admittedly not particularly hard, still is a sign of a political willingness in this country to demand a good level of integration from prospective new citizens. Not only is it exclusively available in French and English (and thus tests command of these languages as well as knowledge of the country), but it forces applicants to show at least some interest in the nation. While producing documents and filling in forms can be delegated to a cornucopia of immigration advisors, taking the test cannot. Many European nations would shy away from such requirements, but Canada's entire immigration system is highly selective and overtly tailored to the nation's own best interests. Young, well-educated, healthy, employable candidates with command of at least one of the official languages are clearly favored in a points-based system that is transparent and objective. In applying it, the Great White North welcomes about 250'000 new citizens every year, a very respectable number on a population of 35 million. And it applies none of the implicit origin, racial or religious biases that often trump the agenda in other nations. 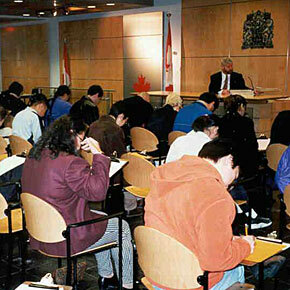 While the former Conservative government did tweak with the citizenship act to tighten some requirements (causing much headache for this frequent traveller), the criteria remained fair and equally applied. Neither end of the political spectrum in this country is fundamentally opposed to new arrivals, but there is also a consensus that immigration should be attuned to the country's needs and not a free-for-all. Favorable geography makes it possible to pick suitable newcomers. Sharing a land border only with the US, Canada is largely spared uncontrolled waves of refugees showing up on its doorstep. The current government makes much hay of its decision to fly 25'000 (carefully screened) Syrian refugees here this year. Countries such from Turkey to Germany do not have the luxury to pick and choose like that.